I do very well writing music and stories that "feel good" but sometimes when needing to express the heavier emotions I have some resistance because that doesn't always feel so good. So for the last few weeks I felt blocked in writing the musical I've been working on, because I thought that the plot was going to get our protagonist, Mark fired by his domineering boss. I finally simply started writing the scene, but some gifts from my life started to contribute. I've been learning about asking the right questions to help people get to the bottom of and release distress, and had an opportunity to do this recently with a dear new friend. As I was writing, Mark's boss was on a rant and about to fire him but Mark interrupted with some caring questions about how his boss had become so pain-ridden. The boss had never experienced such a love-based interruption and it opened an opportunity for his healing - and this ended up changing the whole scenario! I'll be sending the musical result of this shift in a later newsletter, once it is recorded, but in the meantime, here's a demo of an earlier song where Mark, Tom and Glenda go to a UFO convention. It starts in a kind of circus atmosphere, and later shifts into a Cosmic journey called "We Are One." "We Are One" is sung by Kaleo Wheeler, Dielle Ciesco, George Peery and myself. 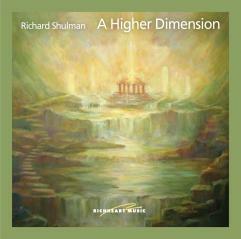 Here is a preview of my solo piano album "A Higher Dimension" to be released in a few weeks... Actually re-released, as it was originally released in 1988 and was the first recording I did where I could say to myself "If I die tomorrow, I will feel complete having done this album." Email me with your comments.... Thanks! Monday, May 4th at 9:00 pm EST (Eastern Standard Time - NYC) I'll be hosting a free teleconference about the New Age Music business. We will be networking and sharing information on recording and marketing music in the alternative community. To participate in the conference, call 1-785-686-2806 at 9:00 pm EST on Mon. May 4th. Then, when prompted, key in 1427# on your phone. My trio with Mike Holstein, bass and Sonny Thornton, drums, will be performing at St. Matthias Church at 3:00 pm, Sunday afternoon May 17th. Our performances are magical, and I'm thrilled every time we get to play together! St. Matthias Church is off South Charlotte St. by the traffic light at Max St., up on a hill at 1 Dundee St. There is additional parking across Charlotte St. at the public works building and on Max St. 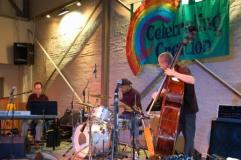 Here's a photo from our "Friends of Shayla benefit performance last month at Jubilee. Mini concert as part of Crystal Visions' 20th anniversary celebration. Performance and Booth 656 at the International New Age Trade Show (INATS) at the Denver Merchandise Mart, Denver CO. This is a for-the-trade only expo for retailers, wholesalers and manufacturers of uplifting products and services. Everything is waking up in nature here in Asheville. And I am too!